Executive Thali For Rs. 79 Only At Jiva is an event that took place between 01-Jan-2006 and 30-Jun-2007 in Hyderabad. The Executive Thali has paneer curry, dry seasonal veg., Dal Makhni, Dahi Pakodi, Pudina Paratha, mini Nan, Papad, pickle and salad. It comes for Rs. 69 and is not too different from the regular thali except for the paneer dish. Guess there is something 'executive' about cottage cheese. Be the first to comment on Executive Thali For Rs. 79 Only At Jiva! Just use the simple form below. fullhyd.com has 700,000+ monthly visits. 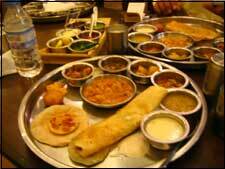 Tell Hyderabad what you feel about Executive Thali For Rs. 79 Only At Jiva!